NEW YORK, September 26, 2018 /3BL Media/ - More than 120 Chief Executives from some of the world’s leading businesses joined Heads of State and Government and leaders from both the United Nations and civil society today to explore innovative solutions to some of the most pressing challenges of our time as part of the UN Global Compact Leaders Summit 2018 during the 73rd regular session of the UN General Assembly. 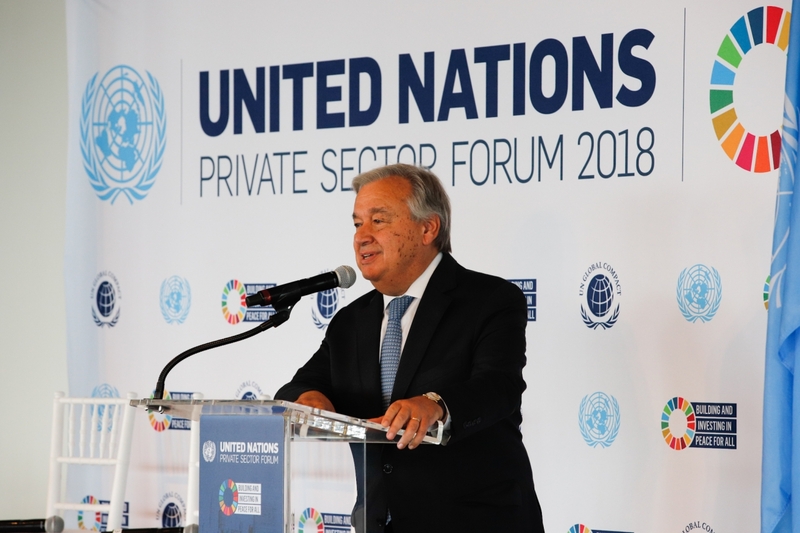 Working together in support of sustainable development and peace was the topic of discussion at the 10th annual United Nations Private Sector Forum — the high-level luncheon of this year’s Leaders Summit. 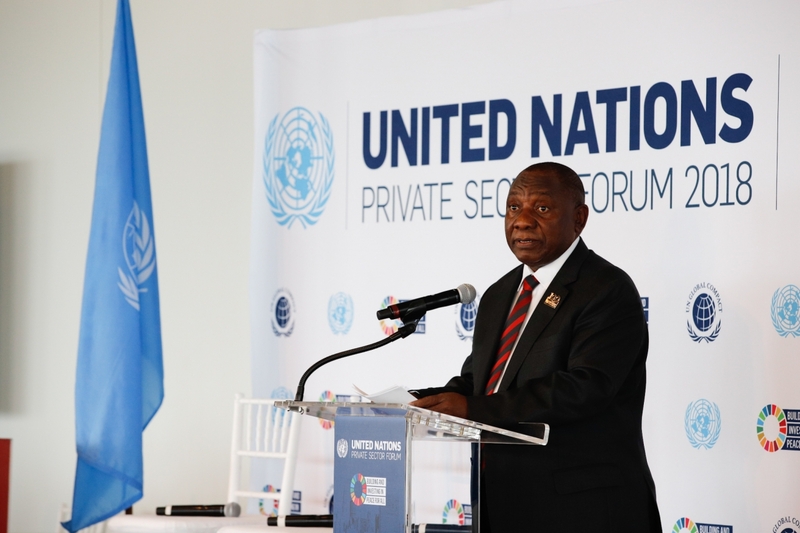 Hosted by UN Secretary-General António Guterres, the Forum celebrated the legacy of Nelson Mandela through the theme of building and investing in peace. In his opening remarks, the Secretary-General emphasized the critical role that business must play in building and maintaining peace, including by upholding the Ten Principles of the UN Global Compact, especially in challenging contexts. “What matters in the UN Global Compact is that you are committed to values, and those values are exactly what makes your companies not only profitable, effective companies to the economy, but companies that contribute to prevention and sustaining peace which are now central to our concerns at the United Nations,” the Secretary-General said. Demonstrating the increasing engagement from responsible business, the Forum saw more than 60 leading CEOs make over 140 new expressions of support for eight different multi-stakeholder initiatives that advance peace — in areas ranging from peace, justice and strong institutions to humanitarian action to the empowerment of women and the youth. As the main multi-stakeholder stocktaking opportunity during the UN General Assembly week, the Leaders Summit convened an international community of leaders from business, investor groups, Government and civil society together at the United Nations for a collection of high-level engagement and networking opportunities. Nearly 400 business leaders, including over 120 Chief Executives, attended the 2018 Leaders Summit, demonstrating the role of business as a driver for the transformational change needed to deliver on the 2030 Agenda. The Summit also featured a candid discussion around business progress on equality and human rights by hosting an intimate CEO Roundtable. During the Roundtable, 31 CEOs — representing companies of all sizes, sectors and geographies — discussed concrete actions to close the inequality gap and advance human rights as a driver for successful business, building on the outcomes of local CEO Roundtables hosted by Global Compact Local Networks throughout 2018. “It’s a tough journey, but there is the short, the medium and the longer-term benefits, and we start one step at a time,” she added. Total (Oil & Gas, France) launched an industry-wide initiative together with BP, Equinor and Shell to create a collaborative approach to human rights supplier assessments in the energy industry. China National Machinery Industry Corporation (SINOMACH)(General Industrials, China) committed to expanding its “Bringing Poverty to the Boardroom” programme. Earlier in the day, the Leaders Summit kicked-off with a welcome breakfast focused on business leadership for the Sustainable Development Goals. UN Global Compact CEO & Executive Director Lise Kingo presented the 2018 class of UN Global Compact SDG Pioneers — business leaders from around the world championing the SDGs through their companies and inspiring others to advance the 2030 Agenda for Sustainable Development. Each SDG Pioneer spoke about how they are working to advance the Global Goals both through their own company and by mobilizing others. The afternoon session highlighted activities of the UN Global Compact from the past year aimed at driving progress and scaling impact. Organized against the backdrop of the current priorities of the United Nations and upcoming activities of the Secretary-General on financing for development, climate change and the 2020 Ocean Conference, the session aimed to connect the dots between the world’s most pressing challenges and the innovative solutions that can help business and partners to tackle them at scale. 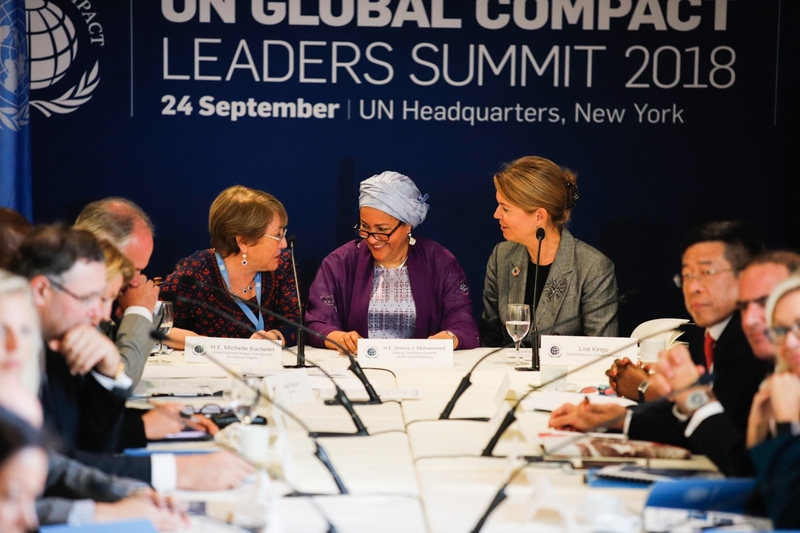 In a discussion about leveraging the Ten Principles to generate impact for the Global Goals, Lise Kingo noted the recent launch of the UN Global Compact Academy, a new digital learning platform for business professionals at all levels. The full-day of events was capped off with a Leaders Summit Reception at New York’s iconic Museum of Modern Art during which the 34 companies recognized as Global Compact LEAD were announced by Lise Kingo. Identified as the most engaged companies participating in the UN Global Compact, the group is comprised of companies from nearly 20 different business sectors and represents every region of the world. In 2018, these companies have qualified for LEAD recognition by being a participant in at least two Action Platforms, which demonstrates their commitment to fostering leadership practices in line with the Ten Principles and Global Goals, and for submitting an Advanced Communication on Progress. 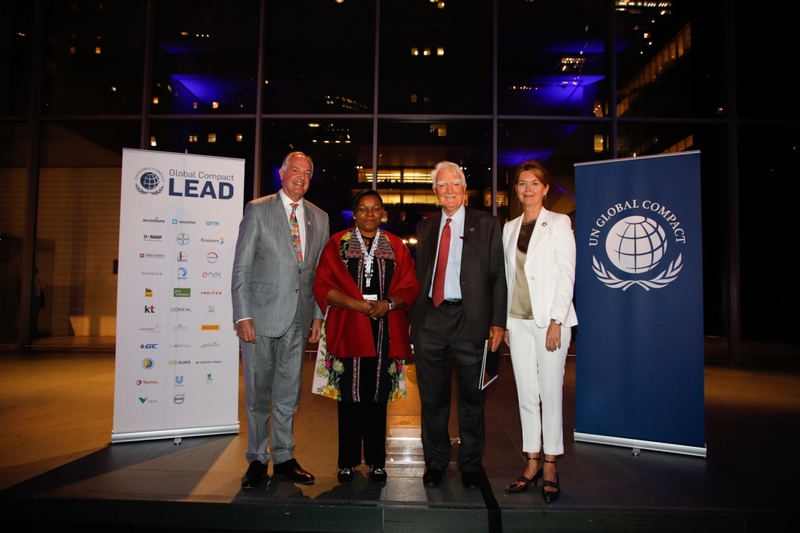 Then, Lise Kingo joined UN Global Compact Board Vice Chairs Bola Adesola and Paul Polman in celebrating the legacy of outgoing Vice-Chair, Sir Mark Moody-Stuart. Sir Mark has served in an advisory role to the Compact since its inception, and as Vice Chair of the UN Global Compact Board for 10 years, beginning in 2007. He was recognized for his strong leadership as well as his passionate advocacy for Global Compact Local Networks. Sir Mark will continue to serve as a Board Member through his role as Chairman of the Foundation for the Global Compact. 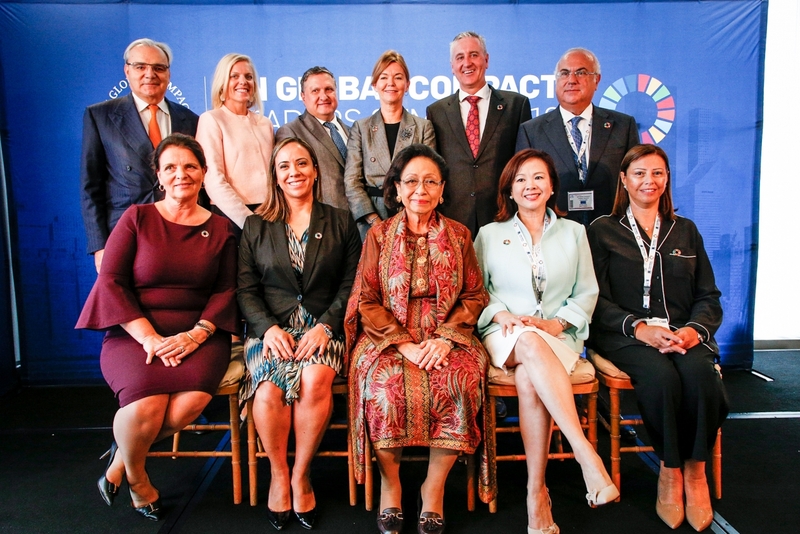 The UN Global Compact Leaders Summit Reception, co-hosted by the Government of Norway, offered an opportunity to reflect on the outcomes of the day, with a specific emphasis on sustainable ocean business. In the lead up to the 2020 UN Ocean Conference, the reception was an important opportunity to engage business in the ocean agenda, and featured remarks from Erna Solberg, Prime Minister of Norway. Lise Kingo also spoke, highlighting the work of the UN Global Compact Action Platform on Sustainable Ocean Business. The UN Global Compact Progress Report 2018 provides an assessment of how companies in the UN Global Compact are adopting the Ten Principles and taking action to deliver on the Sustainable Development Goals. Based on data collected in the UN Global Compact annual survey and other sources, the report takes stock of how companies are performing when it comes to integrating the Ten Principles into their strategies and operations. The report also offers a review of current progress on each of the Global Goals and considers impact measurement opportunities. Building Peace and Prosperity: What Business Can Do provides a list of concrete actions that different stakeholder groups — including business, the investor community, Governments, the UN and civil society — can take to scale up business action and investment in high-risk areas. It also provides an overview of eight multi-stakeholder initiatives that support stakeholders in scaling up these actions. Decent Work in Global Supply Chains: A Baseline Report summarizes data from bilateral interviews with supply chain, procurement and sustainability executives of companies that participate in the UN Global Compact Action Platform on Decent Work in Global Supply Chains. The report presents insights into some of the key challenges and opportunities that companies face in their efforts to develop more sustainable procurement strategies. It also offers practical examples of steps taken to combat pressing human rights issues in supply chains, such as modern slavery, child labour and non-compliance with employment standards, and references relevant initiatives and resources for further guidance on these issues. SDG Bonds & Corporate Finance: A Roadmap to Mainstream Investments seeks to inspire and guide companies, Governments, cities and others involved in the implementation of the 2030 Agenda to tap into the private capital markets and benefit from cheaper and more reliable capital to support the implementation of their SDG strategies. It also introduces a roadmap for mainstream SDG bonds and corporate SDG finance to tap into the largest assets classes and respond to the specific financing challenges in emerging markets.